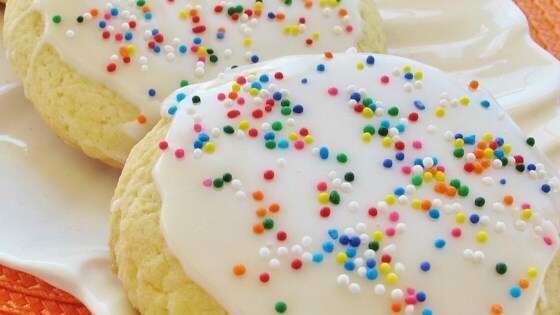 "An old-fashioned recipe, for fragrant and soft sugar cookies. You will not get the best results if you choose to use margarine and imitation flavorings. Decorate with your favorite icing and decorations." Beat butter, egg, vanilla extract, and almond extract together in a bowl using an electric mixer until smooth. Add confectioners' sugar and beat until incorporated. Mix flour, baking soda, and cream of tartar into butter mixture until dough sticks together. Cover bowl with plastic wrap and refrigerate for at least 3 hours. Cut dough into quarters and roll each quarter onto a floured work surface to almost 1/4-inch thickness. Cut dough into shapes using cookie cutters and arrange on the prepared baking sheets. Bake each batch in the preheated oven until edges start to brown, about 8 minutes. Pretty good flavor. Kodi made them into shapes and covered with frosting to decorate.